Prod Co: An Enterprise Production distributed by MGM. Prod: Harry Sherman. Dir: André de Toth Scr: Graham Baker and Cecile Kramer from a novel by Luke Short. Cin: Russell Harlan, 1:1.33, b/w. Mus: Adolph Deutsch. 94 minutes. Released 28 June 1947. Cast: Joel McCrea (Dave Nash), Veronica Lake (Connie Dickason), Don Defore (Bill Schell), Donald Crisp (Sheriff Jim Crew), Preston Foster (Frank Ivey), Arleen Whelan (Rose Leland), Charles Ruggles (Ben Dickason), Lloyd Bridges (Red Cates). A ramrod is a rod for ramming down the charge of a muzzle-loading firearm; by extension, it has come to mean anything that is very straight or rigid. In North American usage, in cattle country, it is the boss or foreman of a crew (but not the owner himself: the owner’s agent or segundo, the number two man in charge). In my life it also means a sort of Flying Dutchman of a film that reappears at (rather long) intervals, a haunt to remind me that I haven’t done what I said I would for it. I first saw part of Ramrod one afternoon in 1971 in Los Angeles. A friend decided to flick on the TV. In those days, even before multiple cable channels, it was hard to find a time when a movie was not being broadcast. We got a black-and-white western neither of us had seen. But I quickly knew what it was because I had read Luke Short’s novel: we tuned in two-thirds through the movie, just in time to see Frank Ivey backshoot Bill Schell at night, in the mountains, with a double-barrelled shotgun. It was the first André de Toth film I’d seen, and I set out to see both the rest of Ramrod and the rest of de Toth. That’s how it was back then: 50% scholarly dedication to completeness, 50% drive to see more of something that interested one. But putting Ramrod in its place, or one of its places, or some meaningful place, requires some context/apparatus/armature/history. I see it as a turning-point film—a skillful and moving summary of a long tradition (which it bleeds like a leech), and a definitive break with that tradition, setting up a new area of possibilities which proceed to change the genre—in the direction of film noir (2). I also see it as an isolated film, a film unlike others of its type before or after. It is hard now perhaps to understand the range of activity covered by the term “western” when Ramrod was written in 1943 or filmed in 1947. In popular books and film then, westerns were a staple: there were a lot of them every year and so they provided a wide, deep genre pool to play in and to invent with. And like all genres, it was not pure and could never be: genres work by cross fertilization; they’re like DNA, always teamed with (at least one) other genre in a double helix (grant funding is now being sought for the human genrenome research project). André de Toth (3), Hungarian, sharpened his directing, writing, trouble-shooting, and producing skills in the complicated, shifting world where independent producers and companies relate symbiotically to major studios/distributors. He had two important mentors/sponsors in this: through the Hungarian connection, the Korda family, first in England and then as they became involved in US production; then, in the equally complex world of international co-productions of the 1960s, Harry Saltzman of James Bond film fame. De Toth was never a studio contract director: he lived by his wits and his luck and his contacts in the chancy world of one-off independent production contracts. He directed his first film in Hungary in 1939. The war drove him then to England; he directed his first Hollywood film in 1943. 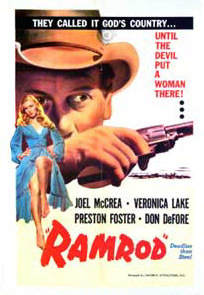 Four years later, he directed his first western, Ramrod, for the newly formed Enterprise Productions, one of many independent production companies which sprang up between the end of World War I (1945) and the U.S. Supreme Court’s 1948 Paramount Pictures anti-trust divestiture decree, after which the floodgates opened for indie production. 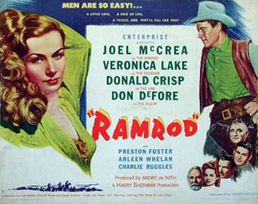 Ramrod established de Toth as a major directing talent in the budget stratum immediately below studio A-picture dollars but above the various levels of exploitation—in the decade from Ramrod, he worked with Joel McCrea, Gary Cooper, Robert Ryan, Richard Widmark, and Randolph Scott. Enterprise Productions foundered on its ambitious prestige production, Lewis Milestone’s Arch of Triumph (1948), but de Toth began a career shrewdly exploiting the opportunities in a fragmenting studio system which increasingly left major stars looking for independent film opportunities in which they could either participate directly in the gross receipts or, even better, become producers or executive producers (producers got paid before gross receipts points-holders). De Toth directed a seminal noir, The Pitfall (1948), and at the end of his directing career Play Dirty (1969), which joins Too Late the Hero (Aldrich, 1970), Hell Is For Heroes (Siegel, 1962), Attack! (Aldrich, 1956), and Men in War (1957) as one of the most corrosive war films of the period. In the decade from Ramrod on, de Toth became a major player in studio-sponsored independent westerns, an area of very interesting work not given much attention then or now. 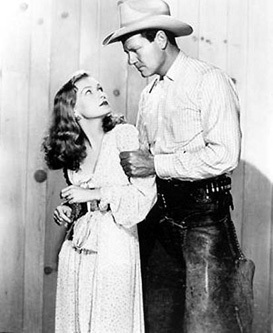 Not talking here about Ford’s cavalry trilogy, or Red River (Hawks, 1948), or The Gunfighter (King, 1950), but rather films made at Warners, Universal, and Columbia, within a producer’s unit, to a budget, and often with series stars, particularly Randolph Scott and Joel McCrea (4). De Toth’s successes in this area include six Randolph Scott films from Man in the Saddle (1951) to Bounty Hunter (1954); Springfield Rifle with Gary Cooper (1952); The Indian Fighter with Kirk Douglas (1955); and Day of the Outlaw with Robert Ryan (1959). Ramrod opened the way for more celebrated later work: Anthony Mann’s The Furies and the James Stewart westerns beginning with Winchester ’73 (both 1950), Budd Boetticher’s Randolph Scott cycle beginning with Seven Men From Now (1956), and throughout the 1950s the increasingly inventive westerns of Samuel Fuller, Robert Aldrich, Nicholas Ray, Jacques Tourneur and Joseph H. Lewis, among others. In the 20th century (after the 19th century dime novels), popular western fiction developed from Owen Wister’s The Virginian, 1902, the watershed of pulp western novels. Then came Zane Grey and Max Brand (pseudonym of Frederick Faust), both very prolific and popular writers whose work was frequently turned into movies in the silent, then in the sound period. After the stock market crash of 1929, in serious pulp and slick western writing, three strands separate out and never reunite. First, artistically serious, literary novels set on the Western frontier–Frederick Manfred (who worked with native American culture, themes, and characters); Conrad Richter (his The Sea of Grass was filmed by Elia Kazan, 1947); and Walter Van Tilburg Clark, best known for The Ox-Bow Incident, filmed by William Wellman (1943). Second: a line of very formulaic, unremarkable pulp written quickly for quick readers and interesting now for those interested in discriminating in undiscriminating areas. Third: what Gale (5) calls “competent and sincere writers who, nevertheless, aim candidly for the avid mass market”—perhaps the equivalent of serious Hollywood commercial, genre filmmakers who take pride in their narrative skills, their personal voices and touches, and their desire not so much to repeat as to re-do, to transform on subtle levels for (genre-) sophisticated readers/viewers. Experimentation in genre work can be at very discreet, and discrete, levels. This third group of writers includes Ernest Haycox, who from the late 1920s on opened up this sort of writing, and Luke Short (6), his most interesting follower and developer (the group also includes Henry Wilson Allen, who wrote as “Clay Fisher” and “Will Henry”, and the commercial and prolific Louis L’Amour). These four writers are reckoned to have sold 200 million books all up. In addition, along with Zane Grey and Max Brand, their books and stories were adapted into numerous films, television series and episodes, and made-for-television features—particularly, Louis L’Amour, whose books continue to be so adapted at present. For Ramrod, three important things emerge from this literature. 1. A narrative/dramatic/social location and geography. Haycox (who began publishing westerns in the mid-1920s) and Short (began in 1935) wrote several of Frank Gruber’s seven basic western plots over their careers, but they polished and perfected a sort which takes place in a carefully delimited location, usually a valley with a town (“Signal” in Ramrod) which serves as the center of the outlying agrarian community, common or neutral territory (at least, initially); at least two large ranches and their owner/entrepreneurs, usually some smaller ranches as well; a river; a stagecoach line connecting to the outer world—or a railroad; open grazing range (to be fought over); foothills, then mountainous country surrounding/containing all of this; and a road leading into and through these mountains. On this road is located a roadhouse, trading post, store, stageline swing station, or very small and marginal community (“Relief” in Ramrod). These are the five notional locations for a tightly rationed ritual drama. The hero (always a hero: this is a relentlessly male genre), either a small independent rancher, town sheriff, or ranch foreman takes a principled stand against a large, greedy, crooked, and/or plain mad-dog mean rancher or group of ranchers, usually over issues of access to free (common) grazing ranch, or land acquisition (theft, manipulation, graft), or occasionally, the possible introduction of sheep to cattle country (7). Things don’t go smoothly in a range war and by the middle of the story, the hero is dispossessed: he has been driven off his home base—his land or the ranch he works for or the town in which he sheriffs, driven out and up, along the stage road toward the timberline, passing through that roadhouse which provides human, social, and physical comforts no longer available in town, but also serves as a doorway into the absolute wilderness, the default setting where social institutions and niceties do not exist. The hero, hunted, wounded, alone, must go to ground in the wilderness before returning to the town, the valley, to reclaim what is rightfully his: his land, his social position, his woman, his retribution—the shootout with his antagonist, the villain. 2. As insistently as does classic detective fiction, this cycle of western fiction foregrounds the characters’ ability to recognize, analyze, and interpret information, evidence of what has happened. This might be trail sign, or personal property left where it shouldn’t have been, or a chance remark, or something not where it should be, or a pattern broken, a change in behaviour. The characters analyze, evaluate and interpret these bits and pieces for the same reason the detective stories do—to determine what happened in the past and who did what; but unlike the detective stories, in these westerns this information processing is used to reveal motives so as to predict future actions, and so to control or counter that future. 3. In 1943, in his novel Ramrod, Luke Short initiates significant changes within this generic model, changes which reflect the impact of hardboiled (literary equivalent of noir) crime writing on the western high-class pulps (by 1943, such crime writing had been extant for 15 years or so). In doing so, Short ends and transforms a classical novel form into its next stage, just as de Toth’s film does for western movies four years later. Traditional titles superimposed over traditional images of dramatic western landscapes: rocks, mountains, chapparal, a river. The producer’s credit to Harry Sherman is another assurance of tradition: Sherman’s career was devoted to making efficient series westerns of a conservative sort (de Toth calls him “the classiest small western maker”). At a quick glance, the rest of the film looks comfy and old-fashioned too: a quiet, upright hero, a greedy villain, two women—a platinum blonde and a darker one, hard to tell in black-and-white, perhaps chestnut, perhaps redhaired—a hot-headed sidekick, a rangewar that starts with the cattlemen vs. a sheepman and ends up a fight to control the open range. The closer we get to the film, though, the more unusual it becomes. No lone horseman rides out of the wilderness into town or the ranch as a token, an announcement that now the story will start. The story has started without us and we have to catch up to it (8). As soon as “…by André de Toth” clears off the screen, a buckboard comes diagonally toward us from the distance, following a shallow river bed. A man drives, a woman beside him, an outrider following. Hard daylight, hard shadows, sharp edges to the images, a leisurely, folksy tune on the soundtrack, not lively, not sad, not premonitory: reflective, maybe. The long tracking shot continues. The buckboard turns left, now moving across the frame toward the right. As the camera follows, the paraphernalia and people of a town spring up in the foreground, interrupting and punctuating the party’s middle distance progress. We don’t know who any of these people are. A foreground bystander says “Mr. Dickason, your daughter’s with him.” A man next to him spits contemptuously. The party continues, without response, to (finally) a new shot, the film’s second: large in the foreground, a wooden chair frames the entrance to the hotel. The man and woman alight and as they enter, the man says to the outrider, “You’ll be around, won’t you?” and the outrider—we are now close enough to recognize Joel McCrae—says, “Sure, I’ll be around.” The buckboard man says, “Thanks”, the woman—we see it’s Veronica Lake—smiles a warm thanks to him as well, and the couple enter the hotel through a set of batwing doors—common enough in western film hotels and saloons—but these are not woodpanelled or jalousied: they are glass panes largely frosted—etched—and partly clear in a swirling floral pattern. As an image, they recur through the film, fitting into a larger pattern of shots framing the exterior within the interior—more on this later—but their immediate function is to be both seen through and not be seen through, to encourage and frustrate sight, to break up the visible in a metaphoric way. The action here corresponds closely to the first scene of the novel, which comments in its first paragraph (a buzz of pleasure for semiologists): “There were signs for those who could read them.” Indeed. The key issues and relationships—even identities, for the moment—are unspoken, submerged iceberg-like; what can be seen—actions, presences, absences—is meaningful to those who know, cryptic to those who don’t, and the dialogue is founded on this mechanism. What people say seems mundane, unexceptional to the uninitiated but has a pointed history and meaning for those who can follow, who can interpret and associate: a rhetoric of ironic gaps, a plain everyday surface covering, ignoring, or excusing the tectonic shifts of the story. The film (like its contemporary noirs) develops this deadpan, pokerfaced, double-meaning, insider-outsider use of speech directly from the Haycox-Short novels mentioned above, in which (as in the hardboiled writing genre and film noir) people don’t say what they mean: speech is more often a way of hiding, misdirecting, manipulating, or deceiving. But in not saying what they mean, these speakers communicate very clearly and specifically to those who understand them (this is amplified in the film by concrete information: tones of voice, emphasis, gesture and posture, facial expression, eyelines, glances, and gazes: for a spare film, Ramrod teems with these.). De Toth makes a bold strategy of this: he paces the action deliberately rather than frenetically (he goes for spin rather than fast bowling: some viewers find this a “slow” western) and he anchors this in the actors’ line-reading. His characters speak slowly, often gravely, and (except for the cheeky larrikin Bill Schell) always seriously. There is no cheery speech, no overlapping dialogue, no badinage, no heartiness—real or false—almost no voice raised in anger or twisted in sarcasm. Each of the major characters is allowed one, and only one, moment of outburst, emphasis, revelation of intensity or passion (9); otherwise, everything is said in polite, understated, murmuring tones, soothing despite the heavy significance of what is said. Coupled with Adolph Deutsch’s unusual, often ethereal, music, this creates a dreamy distancing effect while at the same time drawing the viewer into the intimacy of soft words spoken quietly and closely into one’s ear. In this, it is a film which has taken its cue from the first films of Orson Welles, The Magnificent Ambersons (1942) particularly; and in this, it partakes of the style-effects of such first period film noirs as Out of the Past, (Tourneur, 1947) and Raw Deal (Mann, 1948). Time flows and blurs in Ramrod (sequentiality does not). Sometime later, that evening, the aging town sheriff, Jim Crew, invites Dave Nash (Joel McCrea) for a drink. Crew dresses like a Scots clergyman—black three piece suit, hat with a dead flat brim—and exudes even-handed rectitude and a balance of concern and distance. Backstory: Dave Nash showed up in town, a stranger in a bad way, having a three-week bender with the local scapegrace, Bill Schell. Crew sobered Nash up and got him a job with a small rancher, Walt Shipley—driver of the buckboard and fiance of her choice for Connie Dickason, the passenger, the daughter of (also aging) prairie grandée Ben Dickason. Shipley wants to bring sheep into the valley—always trouble—and Crew and Nash know that the valley’s alpha male, Frank Ivey, opposes this. Shipley needs to catch the night stage to go buy his sheep. The entire town is watching to see if Ivey will stop him. Nash reckons he owes Shipley for the job, should back his play. Crew says don’t be silly: “It’s a dangerous set-up, you stay out of it.” Then Shipley catches Dave—back through the etched batwings again—and probes for Dave’s general support, which Dave gives. Shipley says “Connie wants to see you—upstairs; she has an idea I might need help.” We don’t know it yet, but this is the noir siren’s call and de Toth gives it the works: a down-tilted shot from the second floor, Shipley at the batwing doors looking up, Nash trudging upstairs around two sides of the shot, the whole thing angled well off both the vertical and horizontal axis—short, flashy, disorienting, vertiginous, and very M.C. Escher: a passage into a different sort of world. Dave knocks, enters, and gets the first of many mirror effects in the film (such effects are also prominent in the noir of the period): he faces a curtained alcove, a dressing table and mirror. Connie appears in the mirror, looking at him, then comes round the corner in person, a platinum blonde vision. He takes his hat off. He has the hairdo of someone who wears a hat all day: flat, plastered down, loosened only where the hatband stops—not sophisticated. He sits. She stands over him (the gag here is that McCrea is well over six feet tall and Lake is a bare five feet), angled over him in her one-shots. Flattened dialogue delivery, as before. Connie wants Walt, his ranch, his sheep project, and the chance to do her father and his choice of husband for her, Frank Ivey, in the eye. She’s told her dad that if any of his men oppose Shipley, she’ll leave home. Will you help, Dave (bat, bat, the eyes)? Dave: “I owe Walt. I’ll help.” (Who Dave is helping and why starts being complicated here: in the bar downstairs, he’s already agreed to back Walt (despite Jim Crew’s advice); now he’s upstairs being vamped by Connie—Walt’s fiancée?—in her bedroom…to help Walt, or…Noir setting in: the damaged outsider Dave is in over his head, but he doesn’t know it—and he’s the hero). The imminent event is the night stage and Walt’s departure on it. The tension between Dave and Connie in her room is broken by its arrival along with a roiling, almost opera buffa, programmatic theme from Deutsch’s music track. Connie says she’ll come down to see Walt off; Dave says if you want to get him killed, do that. She remains watching from her window.Dave tacitly supports Shipley as he goes to the stage. Confident, arrogant Frank Ivey arrives and backs Shipley down—no guns, no violence, just breaks his man: throw his bag down, he ain’t going. And Shipley doesn’t. Walt evaporates. Connie throws herself on her bed crying—in retrospect, we discover, not because of Walt but because she didn’t get what she wanted. Fade out and in. Same shot from Connie’s face in the foreground, across her body and bed to the rest of the room and door, which opens. Connie’s father enters and says he’s come to take her home (what and where “home” is for any character (10) is quite an issue in this film). “Tonight, men could have been killed on account of you, Connie.” “Could have been, but weren’t,” she says. She reviles him, says she’ll fight him and Frank Ivey. Shipley has left her his ranch, which she intends to run in competition with her father and Frank Ivey—implicitly, a rangewar. Because she’s a woman “ …I won’t have to use guns.” (Not in her own hands, anyway). That Connie sets out to punish, or in fact to ruin, these two resented men (one her father and one his designated successor in her life), and to do so by manipulating and deceiving all the other men in the film, puts us squarely in the dynamics of the film noir. Dave goes to visit Rose Leland, the town dressmaker, the town’s most eligible single woman. She asks what he’s going to do now and he answers languidly, “Drift, I guess.” He picks a man’s picture off her table and asks after him: it’s Bill Schell. Then, because she took care of him when he needed it, he offers her some silk cloth as a present. She says she can’t take it—is this because she’s got Bill Schell’s photo? Do they have an understanding? What are Dave’s chances in this? He tells her why he went on the drunk with Bill: his wife died bearing their only child, a son, who would have been six years old this week. But Dave was eking out a small living buying cattle, had to travel, left the boy with friends whose house burnt down, killing the boy and the friends who tried to save him; all this death coming from Dave, from his past. Dave couldn’t cope, broke down. A good, supportive listener, Rose decides to accept the gift of fabric after all (through the rest of the film, we will see bits and pieces of it as she sews). Next morning, through the etched doorway, we see a buckboard stop. Connie gets in, Dave drives. She tells him she’s got Walt’s ranch. She’s mad at Walt: he wasn’t strong enough. But she is: strong enough to fight “Dad and Frank Ivey”. Ben Dickason rides up to take her home, but she says “I’m not going home. I’m moving in on Valley grass.” Ben says, “Men’ll get hurt.” She says, “Your men too.” Dickason leaves. She offers Dave the foreman’s job on her ranch, but he says he’s drifting: “When I take the count it’ll be for my own mistakes.” A smart, ethical position to take, one thinks; such things don’t last long in the noir. The usual fades and dissolves find Dave riding into Connie’s ranch to sign on as foreman. He rides off to hire an outfit. By now, one of the film’s main themes, consequentiality, has certainly been launched. No action, no choice is without consequences, usually unforeseen ones. The presentation of violence in Ramrod marks another lurch toward noir practice. The fight with Red has very clear, bloody consequences for Red’s face and for Dave’s. Later, the beating which blinds and subsequently kills Curly is sadistic: two men hold Curly. Ivey coolly orders Virg Lea to beat him. Virg dismounts, walks up, all without passion. We are made to watch, to anticipate the violence to come and its coldbloodedness: this is not the passion-fight of two men in primal anger, a staple of westerns since at least the 1910s: this is a brutal, professional administration of pain, hurt, and damage against a defenceless victim who has provoked nothing. The faces of Ivey and Virg are expressionless. While this violence may be excessive, it is not out of control; quite the opposite, it is completely controlled, as is all the violence in the film (which makes it the more chilling). Connie tries to intervene, slapping Frank Ivey who responds, “Thanks, Connie, that’s the first time you’ve ever touched me.” (11) The beating of Curly goes on, and on: the scene fades out while it continues. After this scene, as Curly is nursed and tended, he is never shown: only shots of people looking at him and registering revulsion, pity, censure, outrage. It is this line of Ramrod which leads to the ever-more elaborate presentation of violence in the noir work of Anthony Mann, Robert Aldrich, Fritz Lang, et al. ; and a similar shift in westerns, quickly picked up in another Luke Short adaptation, Coroner Creek (Enright, 1948) in which Randolph Scott’s gun hand is sadistically crushed under a villain’s boot-heel (a motif taken up in 1961 by Marlon Brando in his One-Eyed-Jacks) and on into the 1960s and 1970s with increasingly detailed and excessive sorts of violence (Peckinpah, Leone, Aldrich) (12). That night, Connie’s new ranch is burned out. Lots of violent fire imagery, and a prominent insert of Frank Ivey directing the event. (Throughout the film, night is the time for characters to do things they want to hide, not to be seen to be responsible for, or to blame on someone else. Daylight, for public events, is flat and bleached, keyed to the extreme whiteness of Connie’s hair and face, an anti-romantic light which suits the laconic mode of the film). Next morning, Dave and Bill Schell show up, see the desolation. Connie had left to get her things at her father’s ranch, so Dave goes to fetch her (at her father’s house part of Connie’s dissatisfaction is detailed: her father tells her that he has got used to playing John Howard to Frank Ivey’s George W. Bush: I’ve just got used to going along with Frank… They return to the burnt-out ranch in a buckboard, in a shot that precisely mirrors the first shot of the film and underscores the idea of consequentiality: what was happening in that first shot has resulted in what has happened in this current shot. Dave suggests they swap houses: Connie’s burned out ranch for Frank Ivey’s stone lineshack up the road. Bill Schell’s charm gets him into the lineshack at breakfast time and he turns Ivey’s crew out. Ivey’s ramrod, Ed Burma, tells Schell he won’t forget this betrayal of hospitality and, on the way out, says to Connie, “Does your father know about this?”, the sort of patriarchal comment she is not interested in. There is a brief interlude as Connie domesticates the lineshack with the fumbling help of the cowhands—“I can scald a few spiders”, the film noir version of Snow White and the Seven Dwarfs–until, as she cleans the window panes, Connie sees visitors coming: Frank Ivey, to intimidate her by beating Curly to a pulp. Looking from an interior out to an exterior through some sort of frame—door, window, etched batwings, cave mouth—is a continuing trope in the quite formal mise en scène of Ramrod, and part of its particularity. It is as if (highly unlikely in 1947) the characters on the inside looking through the aperture were watching a television version of the events unfolding around them (13). Ironies of scale operate: the characters watching—looking out—are in the foreground and so are much larger; the characters watched—outside—are much smaller but as often as not end up determining the course of events. It’s another way the film constructs its floating quality. As with Sergio Leone a decade later, de Toth takes the opportunity of his first western to rethink the form (14). Along with the sweeping tracking and crane shots, the film uses a special range of transition devices: vertical wipes, lap dissolves, and a great many fades—fade-ins, fade-outs, fades to black—which produce a dreamy, gliding movement through the film’s events. Along with the dialogue stylization, deliberate and unhurried storytelling rhythm, interior/exterior image constructions, this creates for the viewer a very cool, distanced effect, one which comfortably houses the film’s consequentiality, determinism, and its total implacability, as icy and unavoidable—as accepted by the characters—as any Icelandic saga. In this accomplishment, it stands alone among westerns (de Toth’s later westerns don’t try to duplicate this; they go in other directions). Bill Schell braces Ed Burmah, Ivey’s foreman, in a stable and rawhides into an unfair fight, killing him and effectively violating Dave Nash’s injunction to keep everything legal. Connie decides to have Schell stampede her herd at night and blame it Frank Ivey (their dialogue is wonderful: she’s pitching and he knows it. She asks him something, he starts to answer: “Well, to tell the truth…”; “Why bother?”, she interrupts, and pulls him into a hot kiss). Jim Crew goes to arrest (the framed, if not exactly overall innocent) Ivey, who kills him in the same underhand way Schell got Burmah. Dave Nash tracks Virg Lea and kills him and, for good measure, Red Cates, who also wounds Dave severely in the shoulder (he goes through the rest of the film with his left arm bundled inside his shirt, a strange hunchback, now without his gunbelt). Schell hides him in a cave in the mountains. Connie ignores Rose Leland’s warning and follows the trusted retainer bringing food and medicine up to Dave and Bill—and is of course followed herself by one of Ivey’s men. Ivey comes for them. They split up—but not before Schell tells Dave, in front of Connie, that he killed Burmah; in the ensuing pause, Connie fails to tender her own confession—Connie goes back to town, Bill takes Dave Nash’s horse—so that Ivey will follow him, which he does—and Nash sneaks back toward town. That night, Ivey kills Schell and discovers he isn’t Dave. On the way into town, Dave stops at Ben Dickason’s ranch for a fresh horse and learns from Ben: “Frank Ivey shouldn’t have got Bill Schell that way…in the back.” Dave spends the night in Jim Crew’s empty office. In the morning, he selects a double-barrelled shotgun and meets Ivey on the street. And so begins the alternation of longshots and closeups, Ivey looking a big nervous, Dave Nash’s face (thanks to Russell Harlan, de Toth, Joel McCrea) now completely serene, luminous in a way only Connie’s face has been luminous before; this has replaced his hangdog fatalism. He kills Ivey. Rose Leland , now wearing the dress made from the cloth Dave gave her, moves toward him but Connie beats her to Dave. Connie is victorious: she and Dave can now have everything they’ve been fighting for. Rose watches from a distance. “Not us, Connie, you”, Dave specifies, reminding her of their deal, and her betrayals, the stampede. “Would it make any difference if I told you I was sorry, terribly sorry?” she asks. Dave says, “Funny how people fall back on those words, ‘I’m sorry’”. Connie says, “But I don’t want it alone.” Dave says, “So you don’t want it alone: I guess that squares everything”, walking out of the shot, leaving Connie held alone in the shot. The film ends on a closeup of Dave’s hand burying itself in the fat curls at the back of Rose’s head. Ramrod is a film about Connie: without her, there is nothing—very unusual for a western at this time. And among all the other noir touches, it is Connie that aligns the film with film noir. Ramrod is, if you will, the western genre’s version of Orson Welles’s Lady From Shanghai (1948, a year after Ramrod): a decent but terminally naïve man is used and used in very destructive, fatal ways by an utterly immoral woman until, too late, after too much death and deceit, he gets wise and walks away leaving her and chunks of himself behind. Doesn’t get much more noir than that. While I think Ramrod is the definitive film in this shift, we should certainly be aware of similar claims for Raoul Walsh’s Pursued released in March, 1947, three months ahead of Ramrod; and of Robert Wise’s Blood on the Moon the following year (1948). The latter film was adapted by Luke Short himself from his own 1941 novel, Gunman’s Chance, and both have the distinct (perhaps unfair) advantage of Robert Mitchum, who always brings with him the poetic pall of film noir doomed maleness. See his two memoirs, De Toth on De Toth, ed. Anthony Slide. London: Faber & Faber, 1996. André de Toth. Fragments: Portraits from the Inside. Foreward by Martin Scorsese. Preface by Bertrand Tavernier. London: Faber & Faber, 1994. In tone and approach, they most resemble that of his contemporary doppelganger, Samuel Fuller (with Christa Lang Fuller and Jerome Henry Rudes): A Third Face, New York: Knopf, 2002. It goes without saying that such memoirs are, happily, “undependable”: most useful as a creative guide to the writer’s construction of self and world as they prefer it. The celebration and eulogy of this filmmaking is Sam Peckinpah’s Ride the High Country (1962), an autumnal western teaming an aging Randolph Scott and Joel McCrea in, of course, one last job like we used to do. Given two actors whose personae have traded through their careers in postwar westerns on stiff uprightness, Peckinpah chooses one to hang onto his principles and one to weaken, and require redemption. See the film to find out who is who, but it is a well-judged hale and farewell for this brief, rich body of work. Robert L. Gale. Luke Short in Twayne’s United States Authors Series. Boston: G. K. Hall, 1981. This is the standard scholarly handbook covering Short’s literary work and working life; it is less useful for information on his film work or films based on his work. Frederick Dilley Glidden. “Luke Short” 1908-1975, leading writer of popular western novels. His pseudonym is taken from an actual historic western figure, Luke Short, 1854-1893, a gambler, saloon keeper, and gunfighter around Dodge City, Kansas; crony of Bat Masterson, Doc Holliday, Wyatt Earp. For a succinct six minute gloss on this variation, see Tex Avery’s Drag-a-long Droopy (1954). Forgive me for rehearsing the film in such detail, but I suspect few readers will have seen the film; in any case, I need to describe the aspects of the film which are important to this discussion in order to emphasize them, to draw them forward from the swarming matter of the film as a whole. Except, of course, Connie Dickason, for whom no rules apply. On the other hand, the film is insistently parsimonious with gunshots—they are very few, and consequently much more pointed, than in noisier westerns. They are also more stylized as punctuation, rhythm and sound design. A look(and listen) at the cornering and killing of Bill Schell on a cliff, perhaps six shots in all across a period of day into night, each one with a precise tactical purpose, each articulating the sequence into its parts, finishes with the finality of Ivey’s two (One. Pause. Pause. Two) shotguns blasts down into Schell’s back, Ivey’s face lit by the muzzleflashs. The care and stylization here points directly to such later examples as Anthony Mann’s modelling of gunshot sounds, beginning with Winchester ’73, John Ford’s work, especially (both onscreen and offscreen) in The Searchers (1956), and of course, Italian westerns. As would happen a few years later in 1950s US television when George Burns would retreat to his study, turn on his television set, and “watch” what was happening simultaneously in the kitchen below between his wife and her co-conspirators in The George Burns and Gracie Allen Show. And its formalities. Ramrod is very careful with its coding of hats. Frank Ivey wears the hat of an extrovert, a dominator: it’s big, it has lots of curves and swoops and details, looks different from every angle. Jim Crew’s is nearly clerical and symmetrical: the same from every angle, as he is. Ben Dickason’s is the narrow-brimmed Stetson version of a homburg, a conservative range businessman’s hat. Bill Schell’s forward thrusting hat has a wide, flat brim and trim crown with a rakish curl just at the front of the brim, just right for a lady’s man. Dave Nash has a working cowman’s hat in the Oklahoma/Kansas tradition, tightly furled up on both sides and tugged down fore and aft. Connie, as suits her roles and duplicity, wears both women’s and men’s style hats. Rose never wears a hat. The second importance of this hat code is that in the dark night sequences, one can sometimes only identify a character by the hat they wear.